Tickets for events available here! Thank you to everyone who helped make our 2018 pantomime a huge success. 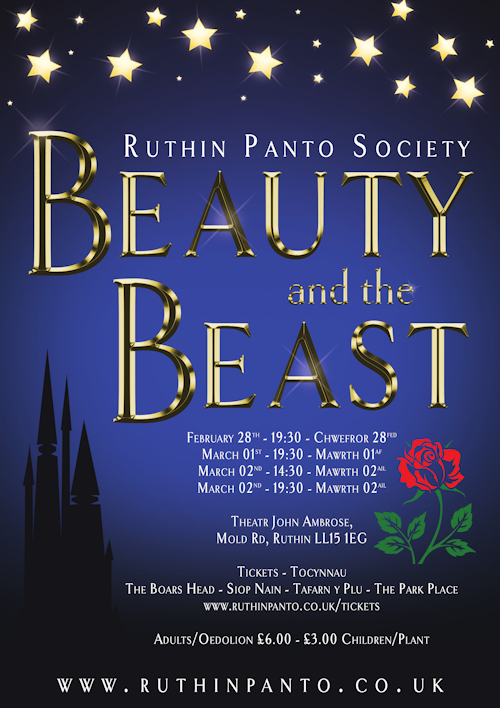 Ruthin Panto Society are grateful to everyone who helps, volunteers and supports the society. Our aim is to provide affordable family targeted entertainment in Ruthin. We have been hard fundraising this year and, as a result, are pleased to be able to keep our tickets for the next Panto, Beauty and the Beast, in 2019 at the same price of £6 for adults and £3 for children. All performances will be held at Theatr John Ambrose at Ysgol Brynhyfryd. Due to the popularity of these shows we do not have tickets available on the door.